Mineral Creek, left, runs alongside the headframe and the area where mine waste will be deposited, as seen Wednesday Sept. 1, at the Silver Ledge Mine. Keith Schoeman of RMC Consultants smooths out the mining road next to a partially rerouted Mineral Creek on Wednesday at the site of the Silver Ledge Mine. RED MOUNTAIN PASS  The weather-worn headframe of the Silver Ledge Mine, visible from U.S. Highway 550 north of Silverton, is a reminder that evidence of San Juan Countys mining legacy is in danger. Erected in the early 1880s, the structure has developed a slight lean. The foundation under one corner has eroded and joists supporting the second floor have split. 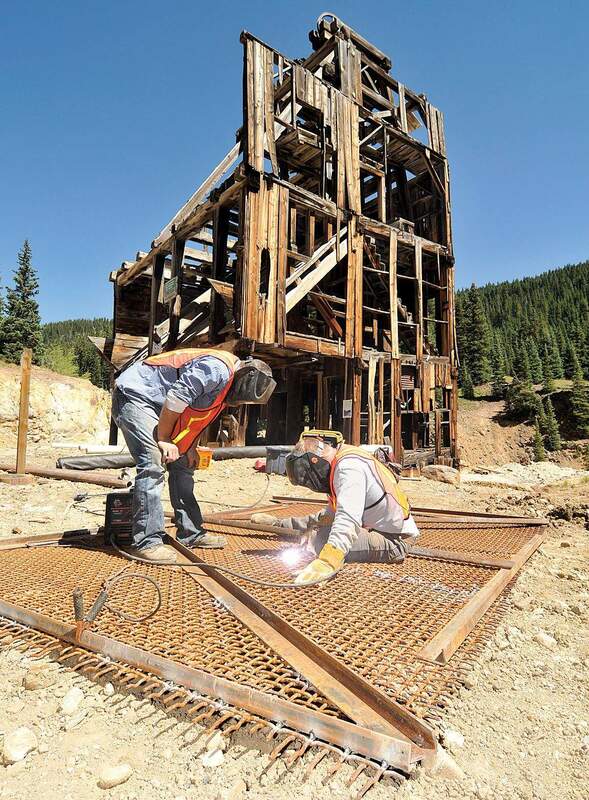 The Animas River Stakeholders, a consortium of private interests and government agencies dedicated to improving water quality in the river, has taken on the task of saving the headframe as part of its work. 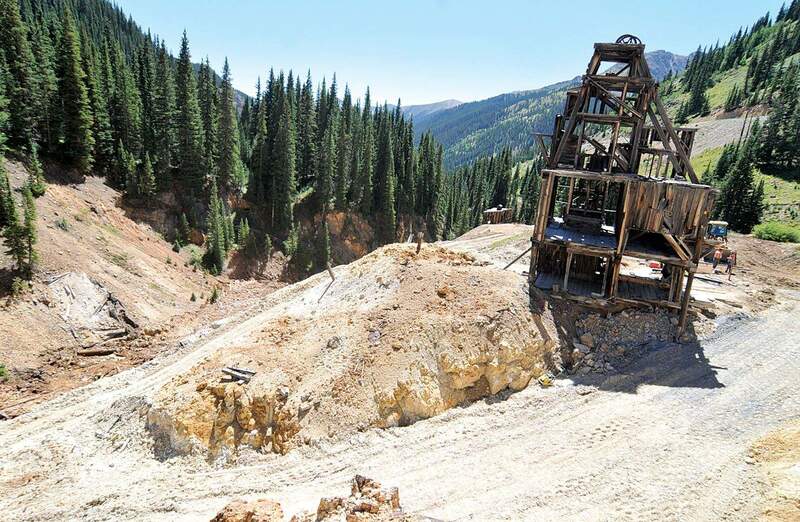 But while a contract to stabilize the headframe is being negotiated, Simon is coordinating work already under way to improve water quality in Mineral Creek, a tributary of the Animas, that runs within yards of the headframe. Already in place are drains to carry upslope water directly to Mineral Creek  water that otherwise would leach through mine waste and reach the creek anyway. Earth-moving equipment has started removing mine waste from Mineral Creek and realigning the channel away from the headframe. A number of ore cars were removed from the channel in the process, Simon said. About 6,000 cubic yards of mine waste has to be moved because the debris contains high levels of galena (lead), zinc and copper, Simon said. The detritus will be stockpiled at one side of the headframe. Simon said cement kiln dust will be mixed in to neutralize toxics, and the mound will be capped with 6 inches of compacted waste and fly ash, another neutralizer, that will turn into an impervious surface. Simon, a restoration ecologist, has coordinated projects for the Animas River Stakeholders since 1994. He also has been a contractor for mining companies and a consultant to the Forest Service, Bureau of Land Management and the Army Corps of Engineers. Simon said the Animas River Stakeholders has done more than a dozen mine-reclamation projects similar to Silver Ledge. The principal sources of funding for the current project are the Environmental Protection Agency through the Colorado Department of Public Health and Environment and mineral severance tax through the state Division of Reclamation Mining and Safety. 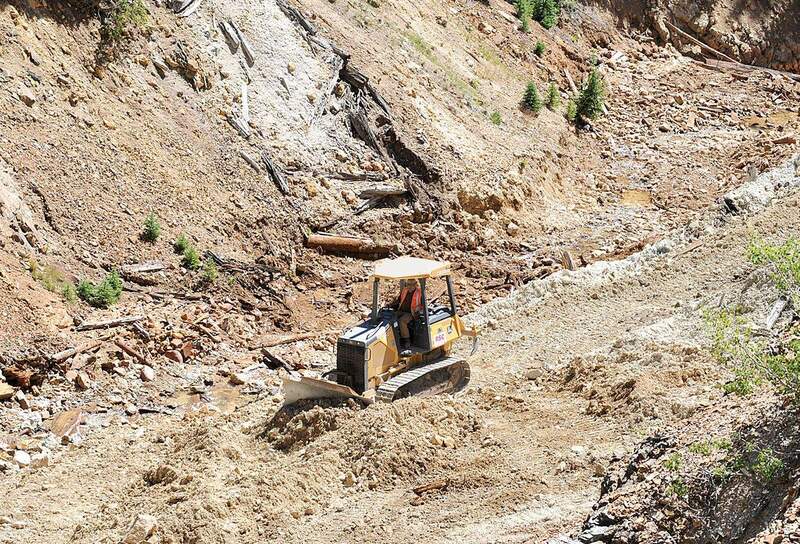 The Division of Reclamation Mining and Safety lets contracts for the work. The Silver Ledge produced some free gold, but it mainly yielded low-grade galena, a lead ore that frequently contains silver, zinc, cadmium and arsenic. The mine was the first in the country to recover a marketable amount of zinc. By the first decade of the 20th century, the Silver Ledge was one of only two mines still operating in the Red Mountain mining district. Bev Rich, San Juan County treasurer and a native of Silverton, recalls that the Silver Ledge operated sporadically into the 1940s.